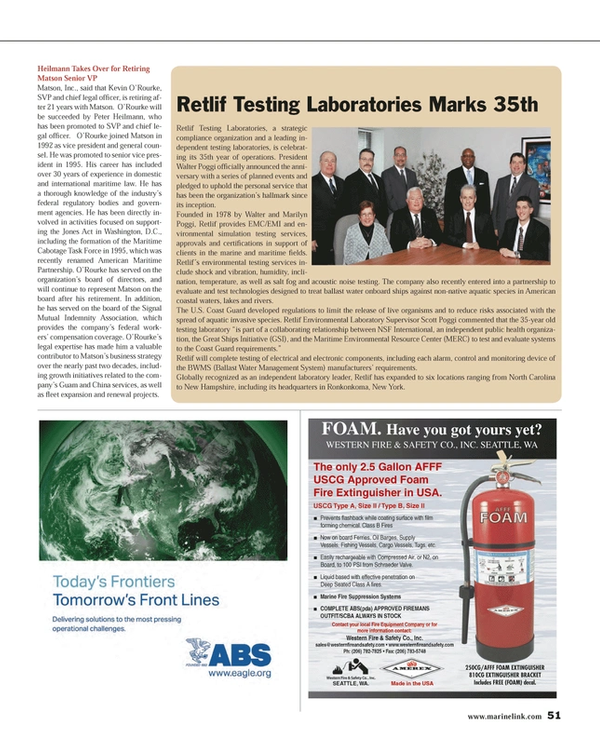 Retlif Testing Laboratories, a strategic compliance organization and a leading independent testing laboratories, is celebrating its 35th year of operations. President Walter Poggi officially announced the anniversary with a series of planned events and pledged to uphold the personal service that has been the organization’s hallmark since its inception. Founded in 1978 by Walter and Marilyn Poggi, Retlif provides EMC/EMI and environmental simulation testing services, approvals and certifications in support of clients in the marine and maritime fields. Retlif’s environmental testing services include shock and vibration, humidity, inclination, temperature, as well as salt fog and acoustic noise testing. The company also recently entered into a partnership to evaluate and test technologies designed to treat ballast water onboard ships against non-native aquatic species in American coastal waters, lakes and rivers. Retlif will complete testing of electrical and electronic components, including each alarm, control and monitoring device of the BWMS (Ballast Water Management System) manufacturers’ requirements. Globally recognized as an independent laboratory leader, Retlif has expanded to six locations ranging from North Carolina to New Hampshire, including its headquarters in Ronkonkoma, New York.